At Thanksgiving this past year, we were in Florida to spend the holiday with my mom, sister and my sister’s family. Oh it was heaven to be warm and so hard to come back. For Thanksgiving dinner, one of the dishes my sister brought was Corn Casserole. I have to admit that I turned my nose up to the title, but it smelled good and I didn’t want to be rude, so I tried some and then I had some more. I really loved it. However, I felt that it needed some other flavors. Usually I get to things like this faster, but this time it took me awhile. I finally decided to try my hand at jazzing up the recipe and I ended up changing it quite a bit. What I ended up with I call Green Chile Corn Casserole and I love it so much. My version has several things that my sister’s version doesn’t. Most notably, green chiles. Here’s the thing about me and green chiles, I love them. I went to high school in Albuquerque, New Mexico and since then, I eat them, a lot. The best brand, to me, are Hatch Green Chiles, which are grown in New Mexico. They are so flavorful and in full disclosure, that is where I got the chiles for this Green Chile Corn Casserole. New Mexicans are kind of chile snobs and this is the brand of choice. Love them! 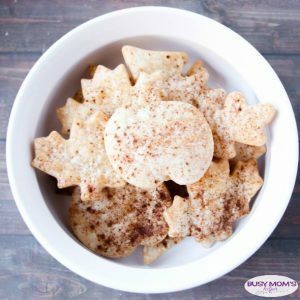 This recipe is really easy to make and it is something you can make ahead of time and then pop in the oven at dinner time. It would also be great for a barbecue. In my case, I was having guests for dinner, so I split the batter between two dishes so I had one for dinner and a smaller one for the next day so I could take pictures and enjoy it again. I had several taste testers and they all loved it, except my husband. No surprise there. His tastebuds are broken. Mix the sour cream, butter and cream cheese in a large bowl. Add in the corn bread mix and corns and mix well. Add the green chiles and 1 1/2 cups cheese and mix well. Pour into a well greased 9x13 inch pan. Bake for 40-45 minutes, until toothpick inserted in the center comes out clean. 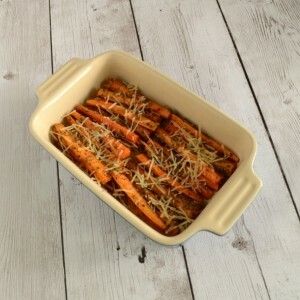 Sprinkle the remaining 1/2 cup of cheese over the casserole and bake 5-10 minutes longer, until the cheese is melted. 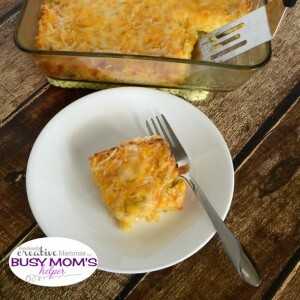 I hope you will try my recipe for Green Chile Corn Casserole and love it like I do. I think I’m going to make it again this week. Not for my husband though. Just for me. What is something you love to eat because you grew up eating it and nothing else compares? Let me know in the comments. I’d love to know your secret. 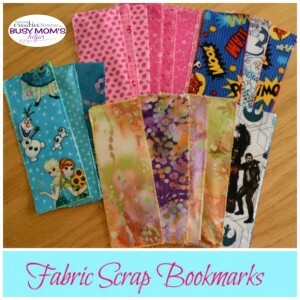 Be sure to visit me at Fearlessly Creative Mammas too. There are lots of things going on over there. Earth Day is April 22nd this year and it occurred to me that we as parents should really teach our children how to care for our earth so it takes care of them as they get older. Children learn better by doing and by having fun while doing. I really think we all learn better this way. 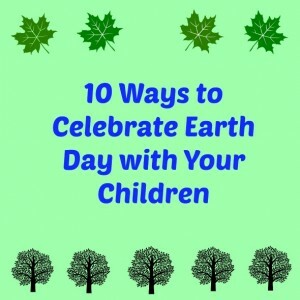 So, I have 10 Ways to Celebrate Earth Day with Your Children. 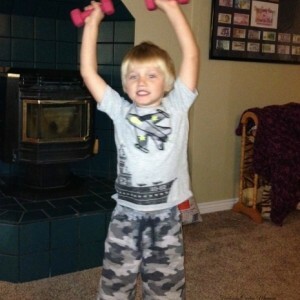 I hope you will do some of these activities with your children and have loads of fun doing it. The first Earth Day was April 22, 1970, in the United States. It is credited with launching the modern environment movement which helped get the passage of the Clean Air Act, Clean Water Act and Endangered Species Act. Now, 46 years later, more than 1 billion people world wide celebrate Earth Day, making it the largest civic observance in the world. Personally, I love the idea of taking care of our planet and responsibly utilizing it’s resources. I also believe that we should teach our children to do the same. Here are my ideas. #1: Take your kids or grand kids fishing. Be sure to check the regulations where you live first so you are fishing in open areas and for the right kinds of fish. While you’re fishing, teach your children to clean up after themselves. We always have drinks and snacks. Don’t leave your trash laying around. Either put it in the trash can or take it out with you. Teach your children to respect the fishing area, the laws and the fish themselves. If you won’t eat the fish, teach them to safely put it back in the water. Teach them not to waste the resource. #2: Take a walk with your kids and have everyone carry a small bag and pick up trash while you’re walking. Make it a game to see who can pick up the most trash. This time of year is a great time to pick up trash because it’s just getting warm in most places and people haven’t been picking up trash in the winter. Remember safety first. If you are picking up trash in a busy area, wear bright clothing and hold your little one’s hands. #3: Take your kids on a picnic. Go to a park so they can have a fun time enjoying the environment. When you’re finished, be sure to pick all of your trash up. If you want to go a step further, don’t bring anything you will have to throw away. 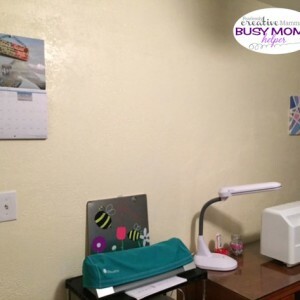 Use things that can be used again, like plastic plates, regular utensils and plastic cups. Teach them that even though you are on a picnic, you don’t have to use things that fill the landfill. #4: Plant a garden. Even if it’s not warm enough where you are, you can get your garden area ready and make a plan for your garden. Let the kids help. Give them a rake or have them pick up rocks. I know it seems like the rocks multiply every year at our house. Ask the kids what they want to grow in the garden. Take a trip to the local garden store and pick out some seeds. You can even get some peat moss pots and start the plants for planting later. #5: Don’t have a garden are at your house? Plant a container garden. You can move that around your house or keep it on a porch. No large yard needed. You can get instructions for this container garden on my blog, Fearlessly Creative Mammas. #6: Keeping with the gardening theme, buy a terra cotta pot for each person and paint some pots to plant flowers in for your entryway. 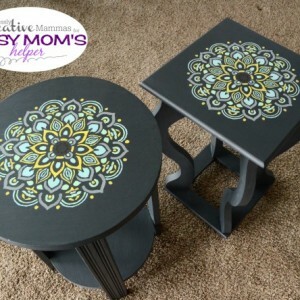 The kids will love that they are helping decorate your yard and you will all have fun painting the pots and putting your individuality in them. When you are finished painting the pots and they are dry, spray them with a sealer so the paint doesn’t wash off. #7: This next idea will take a little planning and money. How about planting some trees? If you plant out in a wilderness area, you can plant smaller trees. If you decide to plant in your yard, plant trees that are a little bit bigger. When we bought our house, we planted a cherry tree in our yard. It was a sapling about 18 inches tall and didn’t look like much, but our kids helped us, so they knew where it was located. About a week after we planted it, our daughter was mowing the lawn and mowed right over it. Darn her. #8: Pick a place and go hiking. We like to hike and the place we usually go is pretty mountainous, but you should pick a place for your children’s age level. We usually see animals like deer, elk and lots of birds. Sometimes we see antelope and coyotes too. There is no one out there but us and we love it. It’s quiet, clean and beautiful. A great way to recharge. Be sure you take what you need to be safe, like enough water and some high protein snacks. We also take firearms because there are bears and wolves out there and you never know if you will run into something that wants to eat you. While you’re out there, pick up any trash you see and carry it out. #9: Take a visit to the local zoo. Our zoo isn’t huge, but the kids love it and it grows a little bit every few years. I took my kids to this zoo a lot when they were young and my grandkids love to go too. While you are touring the zoo, talk to the kids about the different animals, where they are located in the wild and their status as far as if they are endangered, protected, etc. There are usually plaques on each enclosure that will provide this information. #10: Gather things that can be recycled and visit a recycling center. You can go to the city recycling center or a place where you can recycle things like cans for money. My friend’s daughter (with the sun glasses on her head below) recently discovered she could take cans in and get paid for them. Now she has everyone she knows collecting cans for her. She is too funny. Call around because some places have a special rate they pay on Earth Day. She is very excited about that because she gets more money! There you have it. 10 Ways to Celebrate Earth Day with Your Kids. What will you do to celebrate and how will you teach your kids? Let me know in the comments. I love reading them. Happy Earth Day! My husband is a meat and potatoes kind of guy. He was raised in Idaho and that is what he grew up eating. If he had his way, he would eat some sort of beef and some sort of potatoes 6 days a week. What would he eat on the seventh day? Probably pizza. I did not grow up eating that way. My dad was in the U.S. Air Force and we moved all over the place for his job. Since we moved so much, we ate a wide variety of food. I’m pretty sure that I couldn’t eat red meat and potatoes every day. My challenge when I married my husband, almost 25 years ago, was to introduce him to variety in his diet. Veggies too, because he didn’t eat many of those either. Sometimes you find something that everyone loves. Yay! 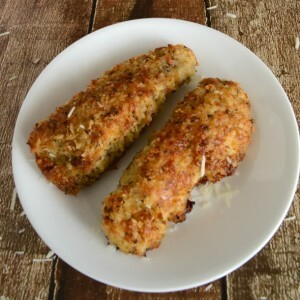 This Cheesy Baked Chicken is one of those recipes and I’m so glad because it is one of my favorite ways to eat chicken. When you make this chicken, don’t let it scare you. It’s really easy to make. Promise. I used plain panko bread crumbs that I found in the bulk bins at our local grocery store. The reason I used panko is because they get crispier than regular bread crumbs. If you don’t want it super crispy, you can use regular dry bread crumbs. Also, if you run out of butter while your sealing in the crunch and flavor, feel free to add more. You can never have too much butter. In a cereal size bowl, beat the eggs and milk until well beaten. In a larger size bow, mix bread crumbs, Parmesan cheese, garlic powder, onion powder and Italian seasoning. Trim fat from chicken and cut into strips. Dip chicken in egg mixture and then bread crumb mixture. Lightly fry chicken in butter until lightly browned on each side, turning once. About 2 minutes per side. Place chicken on greased or covered baking sheet. When all the chicken is browned, bake for 20 - 30 minutes, until chicken is cooked through. If you like chicken as much as we do, you can make extra. It is great as a leftover and it is also great cold, so take it on a picnic, with some potato or macaroni salad, watermelon and lemonade. Our favorite things to have with this chicken are mashed potatoes and corn. It is one of my family’s favorite meals. When I made this for my grand kids, my grandson asked for thirds. He said it is really great and he is a picky eater. I hope you and your family will love this as much as we do. Are you one of those people who jumps from Valentine’s Day to Easter and forgets all about the green holiday, St. Patrick’s Day? I used to be, but then several years ago, I found out I’m not German at all, but I have a lot of Irish blood in my DNA. So, since I do have have that ancestry, I now try to celebrate at least some each year. To be honest, green isn’t my favorite color, but there are a couple of times each year I break out the green. This year I decided to make an easy St Patrick’s Day Ribbon Wreath and share the instructions with you. I promise anyone can make this, even the most craft challenged. Before I get to the instructions, I would like to tell you about the easiness of this wreath. Is that a word? I had knee surgery last week and have been spending a lot of time sitting on my behind. I don’t mind saying, my behind is not loving it. Anyway, between the brain fogs of prescription medications, I made the majority of this wreath. I tell you this so you can tell just exactly how easy this wreath is to make. You will need a styrofoam wreath, yarn, various colors of yarn, four foam shamrocks, scissors and a glue gun. The first step is to wrap the wreath in your yarn. To start the yarn, just tie the end around the wreath form. Start wrapping the yarn, ensuring you wrap it so the yarn is very close together. When you get to the end, tie the yarn off. After your wreath is wrapped, cut your ribbon into four inch pieces. I cut six of each color. Then tie them as shown below, in little knots. For the shamrocks, I used two different kinds, one plain green and one green glitter. I purchased them at a dollar store. Glue the shamrocks together so they are off-set some, as shown in the picture below. Aren’t all of these ribbons fun? After you have them all tied, using your hot glue gun, glue the ribbons and shamrocks to the front side of the wreath. 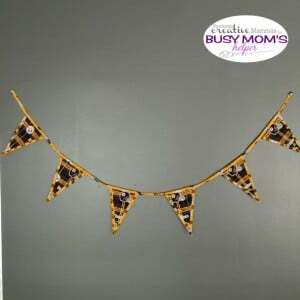 Tie a piece of ribbon around it and hang it up. What are you doing for St. Patrick’s Day. 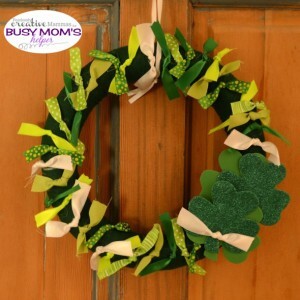 If you want to have a lot of fun, after you make your ribbon wreath, you can plan a really fun St. Patrick’s Day Dinner using the instructions on my post at Fearlessly Creative Mammas. I’m always looking for fun ways to celebrate, so give me your ideas in the comments please. Happy St. Patrick’s Day! !